H x W: 9.5 in. / 7.5 in. The Army and Navy Club traces its roots to December 1885, when seven officers met to form the United Service Club in Washington, DC. 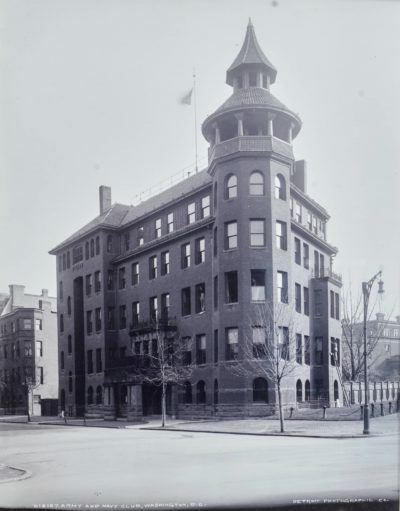 The Club was officially reincorporated as The Army and Navy Club in 1891, coinciding with the completion of a newly constructed clubhouse, pictured here. This original clubhouse was on the southeast corner of 17th and I St NW; the Club moved across I street to its current location in 1912. To preserve history and tradition, important artifacts and memorabilia from the original clubhouse were incorporated in the design of the current building. Most notable is perhaps the carved wooden eagle that presides over the Eagle Grille, which previously hung over the fireplace in the parlor of the original clubhouse.